Words to live by. These aren’t corporate catchwords put together by a marketing team. Audra’s mantra and approach to family law is innately personal and hard-earned, based on her long history of formal learning, serving her community, and searching for empowerment in her own life. These roots run deep – Audra’s parents embody the spirit of compassion and advocacy, each in their own way, and she absorbed those lessons young. Her parents also have a high regard for formal education, and Audra owes her lifelong love of learning, whether academic or through volunteering, to this value. Along Audra’s path of university, volunteering and work, she married and divorced twice, becoming the mother of five children. Her divorces were difficult and hard on her children, so it’s not a surprise that shortly after her second marriage ended, toddlers in hand, she entered law school. Audra’s life has formed the foundation for her approach to family law. She states, “What I have learned from my marriages, my separations and my divorces is independent from what I have learned from formal education. What I do as a lawyer and how I do it is inextricably linked to my life experiences as a daughter, wife, mother and developing person”. The end result of her parents’ influences, her formal work and education, and personal experiences with high-conflict divorce is a straightforward (“no BS”, in her words), child-focused, and compassionate approach to family law. She has learned that solutions aren’t always linear, and that sometimes you need to get creative in order to reach your goal. When you work with Audra, you can expect to be greeted by a down to earth, no-nonsense woman, casually and comfortably dressed when not in court, sipping on coffee and nibbling on the chocolate that she stashes in her desk, purse, and car. She won’t waste any time – she knows the hard way that more money spent on legal services is less money for your kids – and you will be required to roll up your sleeves and do some work. You need to get all your ducks in a row – your finances, your priorities and your knowledge of your situation and the law – but Audra will be there to act as a navigator, an expert and a trusted advisor throughout all of it. In the end, this will empower you as you move through the process of ending your relationship and creating a parenting plan that truly supports your children. In addition to her law degree from the University of Manitoba, Audra is also an accredited mediator and family arbitrator. She founded both the Audra M. Bayer Law Corp in Winnipeg, Manitoba, and continues to see clients through these practices which are now part of the MacLean Law umbrella. However, she is currently based in West Kelowna as a senior lawyer and staff mentor with MacLean Law and is a member of the firm’s management committee. She volunteers extensively with the Canadian Bar Association (CBA) – she co-chairs the CBA’s Okanagan Alternative Dispute Resolution Section, chairs the CBA’s Okanagan Family section and sits as a member at large on the National Family and ADR sections. She is a co-chair of this years CBABC Provincial Conference, and chairs the CBA’s Okanagan Family section. She also sits on the Board of Directors at K and D Transitions, and has acted as a family violence coach for Continuing Legal Education of BC (CLEBC). She has been both an organizer for professional development sessions and conferences and a speaker at these events on various family law and access to justice topics. She is a member of the Hear the Child Roster. And when she’s not campaigning hard for a unified family court in BC, or an overhaul of case conference processes (her Erin Brockovich side comes out every once in a while), Audra unwinds by laughing with family and friends, getting some fresh air with her crew of rescue animals on a hike or in the garden, playing the guitar and listening to music. 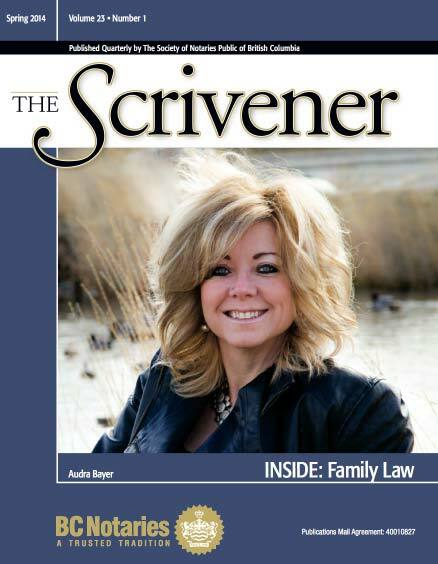 Read the cover story about Audra in The Scrivener, a quarterly magazine by the Society of Notaries Public of British Columbia. Please thank Audra for her professionalism in helping us get through this difficult and awkward time. It is much more desirable to go through mediation than to carry on indefinitely in court while only one party leaves happy. I thought the outcome was reasonable and fair.